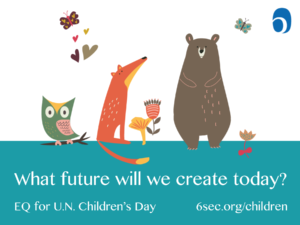 Corralitos, CA- In honor of the United Nations Universal Children’s Day, Six Seconds, the Emotional Intelligence Network, will sponsor a global event focusing on the well being of children. With so many children facing challenging odds, whether they are seeking refuge from war-torn countries, or hunger, Six Seconds believes that one way to help is to focus on building empathy and strengthening relationships through emotional intelligence. Volunteers in 75 countries will hold free workshops to equip children and their adults with the social and emotional skill required to bring children’s rights to action. The free emotional intelligence workshop kits are available for anyone to access by request on 6sec.org/children. The Emotional Intelligence for Children’s Day celebration, or #EQChildrensDay, will increase awareness of the essential role that emotional intelligence plays in our children’s well-being, in our relationships with them; and in turn, in their capacity to make a positive difference in the world. Starting on November 1, 2016, each week leading up to Universal Children’s Day, participants will get EQ kits with resources, tools, and tips to practice emotional intelligence around three essential themes: EQ for Self Awareness, EQ for Relationships, and EQ for Our World. Then, on Nov 20, everyone involved will be invited to the 11:20/11:20 celebration — with a 24-hour feed of sharing pictures, stories, feelings — focused on children. The United Nations declared Universal Children’s Day to encourage societies to support the well-being of children. November 20th is the anniversary of the signing of Convention on the Rights of the Child, the most widely-signed human rights legislation in the history of the world. Led by Six Seconds, Heart Beings, and CrowdRise, The Children’s Day celebrations will create a long-lasting impact as participants will spread enthusiasm and skills for EQ beyond the event, remembering and talking about this as a catalyst for positive change. Children and adults will have specific skills and practical tools they will use everyday and into the future… and organizations participating will have added support and revenues to expand their work spreading emotional intelligence. In addition to the free workshops, volunteers in the project will receive downloadable free games, activity guides and conversation starters for adults and children to practice emotional intelligence. Through a special page on CrowdRise, organizations focused on the well-being of children will be able to raise funds to increase emotional intelligence skills for their staff members and the children they serve. This will multiply the power of EQ #ChildrensDay allowing efforts to sustain. HeartBeings will feature stories of the beautiful work organizations are doing to make the world a better place by infusing emotional intelligence. HeartBeings celebrates what nourishes us, so we can all keep our hearts and minds focused on making the world better.